Best known as the first female news anchor on CFPL-TV in London, Ontario, Ms. Young has had a distinguished career in journalism and public relations both in the private and public sector. Formerly the Manager of Public Affairs and Community Relations for the Thames Valley District School Board, Kate’s department helped spearhead The Pledge—the first Canadian anti-bullying initiative to be recognized with a National Exemplary Bullying Prevention Program Award by the U.S.-based Schools Safety Advocacy Council. As a community organizer, Ms. Young has volunteered much of her free time with organizations that directly impact London West, including the Fanshawe College Board of Directors, the Museum London Board of Directors and the London Health Sciences Foundation Board of Directors. In 2007, London City Press Club named Ms. Young Newsmaker of the Year for her outstanding service to the London community. Ms. Young has a diploma in Broadcast Journalism from Fanshawe College and is the proud mother of two children and two grandchildren. She lives with her partner Brian Meehan. 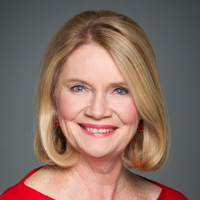 Ms. Young has served as a Parliamentary Secretary since 2015, and is currently the Parliamentary Secretary to the Minister of Science and Sport and to the Minister of Public Services and Procurement and Accessibility (Accessibility).